This article covers creating MCMs or Morph Corrective Morphs. It is a continuation of Advanced: Creating Joint Controlled Morphs (WIP), and assumes you have completed or are familiar with the information it contains. Since this is the most common Morph Corrective Morph, this will be used as an example in this tutorial. The Eyes Closed Control on Genesis links to the two morphs - Eyes Closed Left, and Eyes Closed Right. It will be necessary to create two corrective morphs, one for each side. The first step is to prepare the character for export. Make sure the Genesis figure is in the Zero Position. Apply the new character morph Goblin, as well as the Eyes Closed Right morph. This will be our starting point for modeling the corrective. There are some settings that need to be taken care of before the model is exported. Start by making sure Genesis is selected, then switch to the Parameters Pane. Next, click on General and select Mesh Resolution. Set the Resolution Level to Base. (See Illus. 2). A note on naming the MCM. This MCM will be exported out and saved as MCMdrGoblinEyeClosedR. MCM = the type of morph it is, dr = artist initials (The creature creator has a head morph named Goblin, adding artist initials will lessen the chances of this characters files causing issues with another product) Goblin = character name, EyeClosedR = the morph it is correcting. Open the morph in your modeler of choice and make the eye corrective. When the morph is completed, make sure that the new character morph Goblin is still applied, and the Eyes Closed Right morph is set to 1 Basically, what is in the scene should match what was exported out. The new MCM by default loads under Morphs/Morph Loader. With the new character morph Goblin on, and the Eyes Closed Right morph still on, apply the new MCM control just created and see how it looks. (See Illus. 6) If it is satisfactory, the next step is to create the ERC Links to get it to work correctly. Set the new MCM just created back to 0. It must only operate when the new Character Goblin is applied. (It should not apply when Genesis or a different character morph is applied, unless the Goblin Control is mixed in). It must only operate when the Eyes Closed Right is applied. (Keep in mind that the Eyes Closed Right Control is controlled by the Eyes Closed Control. Anything that gets linked to the Eyes Closed Right control will be controlled by the Eyes Closed Control, which works to your advantage in this case). On the Left side, locate the new MCM that was created for the character. It should be found under the Morphs, Morph Loader Pro... section. If it is not there, click on tab options and use the Refresh Pane option to bring it up. This will take care of criteria 1. The morph must only apply when the Goblin morph is turned on. 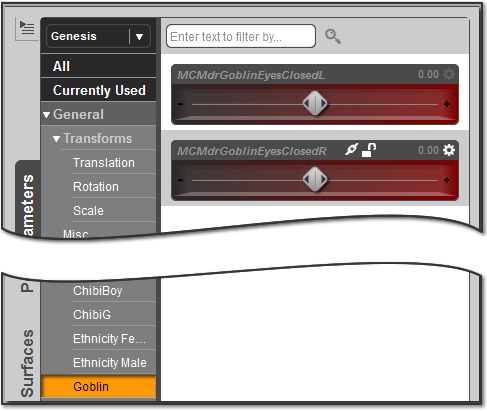 The multiply option will not scroll on the Goblin morph, but now the link will only work when the Goblin morph is applied. Close Property Editor and test the morph. Zero the figure. Apply the new character morph Goblin, and the Eyes Closed Right morph. The new MCM should apply to its full strength. Leave the Eyes Closed Right morph on, and remove the new character Goblin morph. The new MCM should go back down to 0. In this final step we will do some clean up and finalize the location of the MCM. All of this can be done back in the Parameter Settings. Refer to Step 3 if you need help getting back to Parameter Settings. MCMs are meant to only correct morph issues. They should never need to be set by the end user. For that reason, it is best to hide the control and place its location in a Hidden category, to make it clear to the end user that it is a morph that should only work in the background. You are now done editing your MCM. Choose Accept to close the Parameter Settings. This finalizes the MCM creation. This completes the second article in our series. When you are ready, continue on to the rest of the Advanced Character Creation series, linked below.